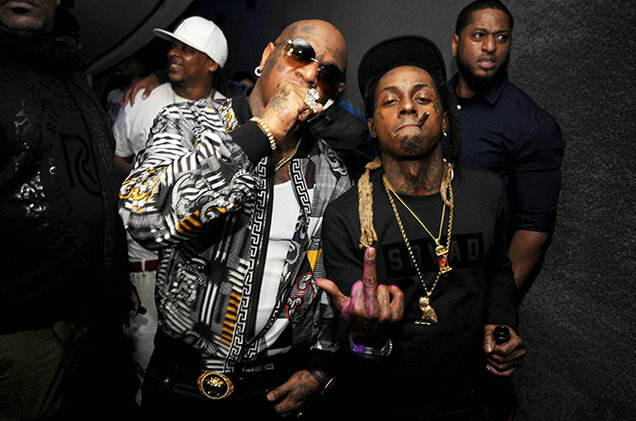 Following a year of rumored bad blood in the Cash Money camp, Lil Wayne and Birdman reunited like old times on Sunday night (Jan. 17), standing tall on the DJ booth at Miami’s LIV nightclub. Birdman and Lil Wayne at LIV at Fontainebleau in Miami, Florida on Jan. 17, 2016. The sentiment stands in stark contrast to a moment six months ago when Bird man allegedly threw a drink at his beloved “son” as Wayne performed at the same South Beach hot spot. Wayne even have slapped the Cash Money chief with a $51 million lawsuit last January over unpaid profits and musical rights. Birdman was also named in an indictment as a conspirator alongside Young Thug in connection to a shooting involving Wayne’s tour bus in April (he has since dismissed the accusations). Still, the pair were all smiles a few weeks after they partied and snapped pics together at Drake’s recent New Year’s Eve performance at downtown Miami’s E11even nightclub. Performing in support of his a street-wear company, Trukfit, which is currently launching a higher end aesthetic with pieces including bomber jackets and jogger pants, the New Orleans rapper looked right at home. Wayne appeared around 2:30am ET, gripping a solo cup while drinking and smoking with his entourage. Floyd Mayweather and Jim Jones were among the VIPs in attendance. The two closed out the late evening by performing classic joints “Stuntin’ Like My Daddy” and “Championship (Pop Bottles).” Hopefully, this precious moment means a near release date for Wayne’s long-awaited and perhaps final LP Tha Carter V.